From the CSMI airport, Modi proceeded to Raigad to inaugurate the new campus of the SEBI's National Institute of Securities Markets in Panvel. MUMBAI: Prime Minister Narendra Modi arrived in Mumbai by an IAF aircraft for a daylong visit to Maharashtra, where he has series of engagements during the day, an official said. 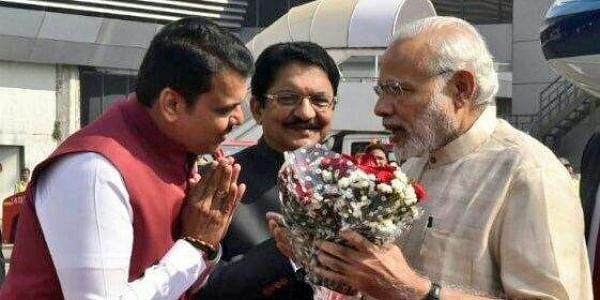 On his arrival at the Chhatrapati Shivaji Maharaj International Airport around noon, he was received by Maharashtra Governor C. Vidyasagar Rao, Chief Minister Devendra Fadnavis and other senior officials. From the airport, Modi proceeded to Raigad to inaugurate the new campus of the SEBI's National Institute of Securities Markets in Panvel. Later, around 3 p.m., Modi will perform the 'bhoomipoojan' for the ambitious sea memorial dedicated to Chhatrapati Shivaji Maharaj coming up in the Arabian Sea, around 1.5 km from Mumbai shoreline at Marine Drive. Thereafter, Modi will go to the Bandra Kurla Complex and perform the ground breaking ritual for the mega-infra project, Mumbai Trans Harbour Link, two new Mumbai Metro lines and elevated road corridors. In the evening, Modi is scheduled to visit Pune and lay the foundation stone for the proposed Pune Metro railway project. Mumbai Congress President Sanjay Nirupam, who was planning to lead a demonstration against the demonetisation, was stopped by the Mumbai Police at his Andheri residence. However, Nirupam claimed he was placed under "house arrest". Prior to his arrival, the PM tweeted from Delhi: "I am honoured to be getting the opportunity to perform the bhoomipujan of Shiv Smarak."